Nikki was four years old and very excited when she became a big sister on Jan. 26, 2007. I had my perfect family of four. Instead of being home with my newborn, one month later I was in the hospital with Nikki after she had a week of high fevers. Nikki was diagnosed with leukemia, AML type. She was given a 50/50 chance of survival. It took three straight rounds of chemo to get her into remission, that was 101 days in Children’s Hospital of Pittsburgh. After only two short weeks home, Nikki and I returned to the hospital to have a bone marrow transplant. The transplant occurred on June 29, 2007 and her baby sister (Ashley) was the perfect match at only five months old. The transplant is a hard process but Nikki did great and came home July 27, 2007. She remained home with frequent clinic visits to the hospital and many many restrictions. It was a long road with a lot of ups and downs, but Nikki was very brave. 2008 was the best year for our family. Everything was starting to get back to normal. Life was good! The best news was all of the tests she had done came back normal. No signs of leukemia! Nikki was looking forward to her 6th birthday party and going to first grade. Then on April 9, 2009, one week before our family was to go on her Make-A-Wish to Disney, she went for a routine clinic visit. Her blood work was abnormal even though she felt just fine. We had to return the next day for a bone marrow biopsy and she was admitted for a fever. Her leukemia was back. How could this be happening again? We never imagined we would be part of the move to the new Children’s Hospital but we were. 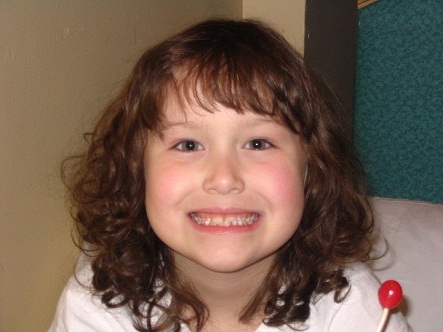 Nikki was the sixth new patient…she told us she was sixth because she was six years old. She continued to smile and play and make the best of her long hospitalization. I think she did better than me. The doctors would not even talk percentages with us this time and we were devastated. But then…her organs had enough….especially her lungs…. When her heart stopped, so did our world. On August 18, 2009 Nikki couldn’t do it anymore. Even though she beat cancer she couldn’t beat everything else. My angel went to Heaven only 10 days after she turned seven. Her hell ended, but mine had just begun. Life without sweet Nikki is very hard and anyone who knew her will never be the same.